1 Preheat the oven to 350°F. Grease a 8 or 9-inch springform pan with butter and line the bottom with a round of parchment paper. 2 In a large saucepan place the beer and butter. Cook over medium-high heat until the butter has melted. Add the cocoa powder and sugars and whisk together. Take off heat and allow to come to room temperature. 3 In another bowl beat together the sour cream, eggs, and vanilla extract until very, very well combined. Add to the butter-beer mixture and whisk together. 4 In another bowl whisk together the flour, baking soda, and salt. Add to the beer-butter mixture and whisk together until it just comes together. Pour into the prepared pan and give the pan a few short drops onto the countertop to shake the air pockets in the batter to the surface and out of the cake. Bake for 50-60 minutes. Allow to cool on a wire rack. Run a knife around the edge to separate the cake from the pan and pop the ring off the springform. 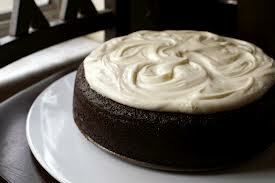 5 Spread frosting on the cooled cake and serve. In a mixing bowl, beat softened, room temperature cream cheese and butter until light and fluffy. Add vanilla and a tablespoon at a time of the beer until desired consistency. Frosting should be slightly thick, but spreadable.